I read an article some time ago, but I still come back to it repeatedly. It provides what Rush Limbaugh likes to call a "teachable moment." From the December 12, 2011, New York Daily News: "NYPD brass to cops: Stop using Kahr K-9 pistol." The article reports that the NYPD has instructed its officers to stop carrying the Kahr K-9 pistol off duty. The Kahr K-9 has a standard 7.5-lb trigger pull, and over 5,000 of them have been sold to the NYPD over the years for use off duty. This 7.5-lb trigger is reportedly "so light" that it has been blamed for a series of accidental discharges—more than a dozen of them in the last few years, none of which has resulted in a fatality. The article details how, after five years, Kahr was unable to supply pistols to the NYPD with the requested 13-lb trigger pulls. "We worked for about three years to try to modify the gun," Kahr's Frank Harris stated. "After three years of trying to meet their requirements, we just had to give up." Glocks issued to NYPD officers have 12-lb pulls—the "New York Plus" trigger. In 2010, the NYPD had 21 reported incidents of accidental discharges and in 2009 there were 23. Of those 44 incidents, only 14 occurred during a confrontation with a suspect. There are so many things wrong with this story that I hardly know where to start. It continues the horrible precedent the NYPD has set by blaming equipment for bad training. The Kahr K-9 is an excellent, safe weapon, and no one who knows anything about shooting would call a 7.5-lb trigger "light". The trigger pull on the Kahr isn't exactly short, either. The NYPD is apparently incapable of training its officers to keep their finger off the trigger, so instead of increasing or improving their training (which would cost the department money, as well as be an acknowledgement that the training was the problem), they mandate that the gun companies provide them modified weapons. I don't dislike Glocks, I love Glocks. I carry a Glock every day, and am in fact wearing one right now as I write this. However, Glocks equipped with the 12-lb New York Plus trigger are an abomination. A few years ago at an editorial roundtable, the InterMedia Outdoors staff had a friendly competition involving a Glock with such a trigger. Everyone involved reported that the pistol was nearly impossible to shoot. 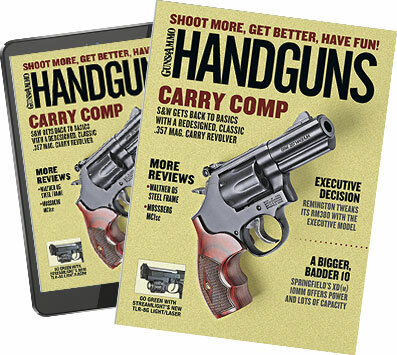 G&A's Handgun Editor Pat Sweeney (a veteran pistol competitor and Master-Class USPSA shooter) won the contest, but to do so, he used a technique he wouldn't recommend anyone use—he was pulling the trigger with both his index fingers. A 12-lb trigger on a Glock only makes it harder to shoot fast and accurately, thereby increasing the chances that an officer's bullet won't end up where he or she intended. No one suggests putting horrible sights on a handgun will make someone shoot it more accurately, so I'm hard pressed to find the logic (that's assuming there is any) behind equipping a handgun with a trigger that is worse than the factory offering. No one has ever suggested a heavier trigger enables a user to shoot a handgun faster or more accurately, and if they did, they're an idiot. to keep your finger off the trigger until your sights are on the target and you're ready to shoot. If you follow just these two simple rules, I could make the argument that a lighter trigger pull was safer than a heavier one, for it would result in less sight movement during the trigger pull process. The only people who like heavy trigger pulls are lawyers and bureaucrats. The problem here is training, not hardware (at least not the way the NYPD brass means). The brave cops of the NYPD deserve better—better guns (Glocks and Kahrs with trigger pulls not measured in metric tons), and better training.